To the unexpected majority of players, Gaijin released the first Japanese tank destroyer devblog today. Many expected Japan to not have a tank destroyer branch with the initial release of the ground forces, as was done with Britain and the United States. Japan focused heavily on anti tank vehicles throughout the war, and today we get to look at one of the most known, the Ho-Ni III. This is the first time Gaijin showns Japan's late war base paint, Olive. In 1939, Japan had grown to understand the need for an anti tank vehicle in the field. 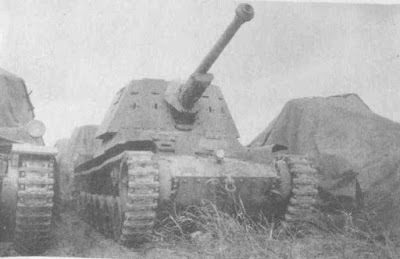 The Type97 Chi-Ha with its 57mm cannon was not sufficient in providing support to the infantry against armoured adversaries. Unlike the Battle of Nanchang, where the Japanese tanks were first used successfully as infantry support against the Nationalist Chinese, the Nomonhan Incident against the Soviets had illustrated the need for an anti tank role'd vehicle. After the Japanese defeat at Nomonhan, the Imperial Japanese military initiated a project to design two types of tanks, an anti tank replacement of the Chi-Ha and a self propelled gun chassis with heavy firepower against armour at range. In December of 39, the two projects were called Ho-I and Ho-Ni. Ho-Ni I prototype during trials. October and was labeled Ho-Ni I. During the prototype trial tests of the Ho-Ni I, the crew compartment openness and the lack of direct fire scope proved to be an issue to the Army. 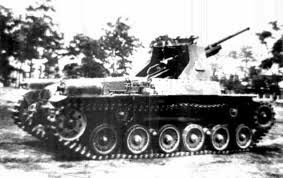 However due to the need of a tank destroyer, the tank entered production and would not have these problems dealt with until mid 1943. It was only then the Imperial Japanese Army had no choice but to upgrade their tank, as it proved too difficult to target tanks at range. In 1944, a prototype was completed and was approved for service. 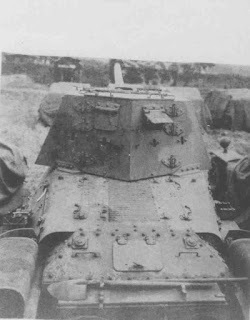 This tank was named Ho-Ni III (II was a variant of the I adding a new cannon, III was a separate tank). Rear of the Ho-Ni III. 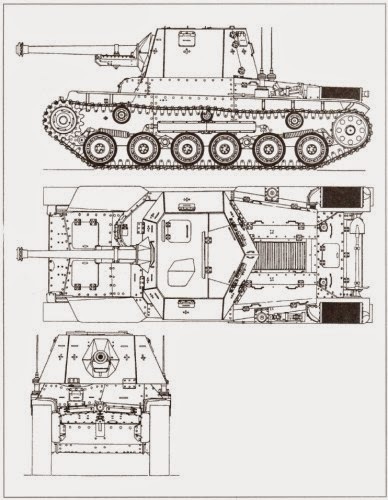 The gun shields on the original Ho-Ni models were replaced by a single heptagonal superstructure consisting of a thickened frontal plate accompanied by two plate cheeks. Two sides plates, and two rear plates constituted at an angle. The thickness of the new superstructure was limited to only 25mm. This wasn't made to withstand tank shells, but rather simply protection against machine guns and other light anti tank weapons. Because the width of the turret is wider than the upper part of the car body, the left and right sides of the turret were overhanging from the car body. At first glance the superstructure appears to be able to turn around the whole circumference as if it was a turret, but in fact it only had a limited swivel for the main cannon. Ho-Ni III outline. The tank had -15 gun depression. The muzzle velocity was 668 meters per second. The testing results of the Type1 APHE shell were mediocre and did not meet the requirements of the cannon. To improve on this, the Army developed a Tungsten-Chromium steel anti-tank shell known as the Type1 AP Tokko Ko. This shell had an improved muzzle velocity of 683 m/s and was capable of penetrating 100mm of RHA at 500 yards, and 85mm at 1000 yards. The Kou was made of nickel chrome molybdenum steel mixed with molybdenum for nickel resource conservation due to Japan's lack of available resources at the time. The Ho-Ni III, by the time it entered production in 44, was restricted to use only in the Japanese home island. Total number of Ho-Ni III's was numbered to 41, and they were issued to the 4th Tank Division during the homeland defense program. All were destroyed and scrapped after Japan's surrender in 1945.
correction "2.4 inches (89 mm) at 250 yards (about 228.6 m)" I think it should be 3.4 inches. And thanks for amazing post again. What was the ho-ni's gun depression? Nevermind I should have looked at that outline above this.